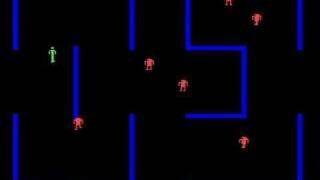 This is a flash remake (for PC computers only) of the Atari 2600 game which was originally released in 1982. The simple maze game is a battle between humanoids and robots. Use the arrow keys to move your humanoid and the Control key to fire. Shoot the robots (you can shoot at their bullets, too) for 50 points. Don't touch the walls and avoid Evil Otto the smiley face, as you cannot kill him! The original arcade version was released in 1980 by Stern Electronics and featured talking robots. Computer-generated speech was extremely rare in those days and very expensive to create. The Atari 2600 version didn't feature speech, and the only console to include it was the 5200. However, later conversions for the 8-bit home computers did include the speech. I remember being pretty excited when the robots screeched "The Humanoid Must Not Escape!". I guess it would be impossible to convince kids today that we could get excited by such simple sound effects, but stuff like this was groundbreaking at the time.